resembling a fox and snake in combat. Here is a list of embedded links to digital images of the New Testament manuscripts in the Kenneth W. Clark Collection that have been digitized. Some of the other volumes are also listed. 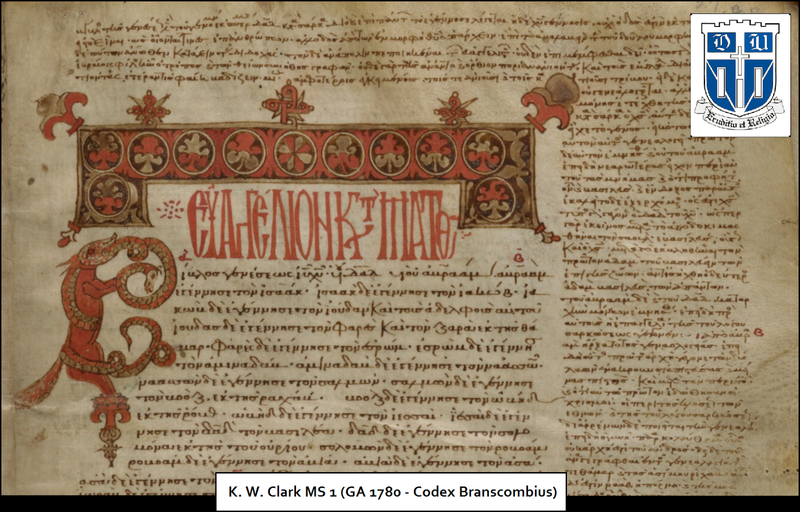 Digitized Gospel-manuscripts are indexed with embedded links to the beginning of each book. MS 2 is GA Lect 1619, a very late (1600’s) Gospels-lectionary, with many blank pages. 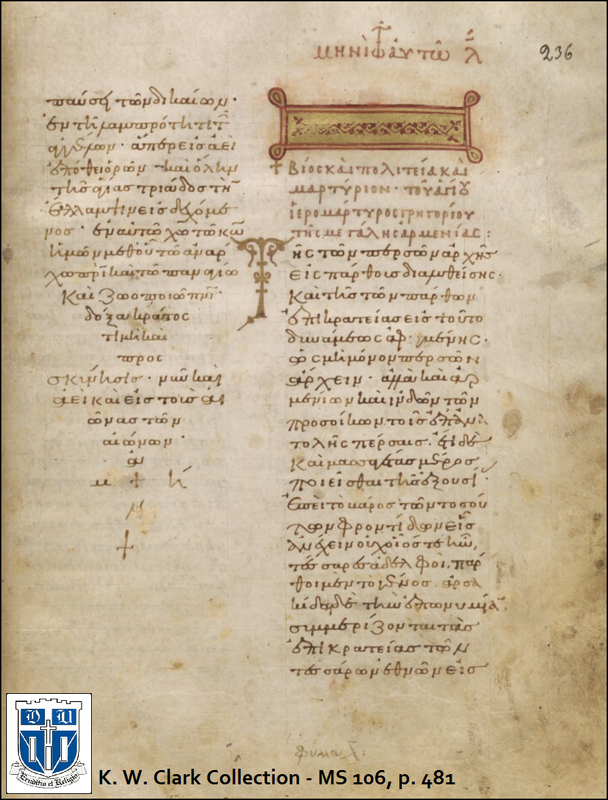 MS 3 is GA 2423, a manuscript of Acts and the Epistles, from the 1200’s. It is not yet digitized. Hebrews is between Second Thessalonians and First Timothy. MS 4 is GA 2268, a leaf from the Gospel of Mark, from c. 1300. It contains text from Mark 1:1-14. A portrait of Mark is in the headpiece. in Clark MS 4 (GA 2268). MS 5 is GA 2612, a manuscript of the Gospels (1200’s). It is not yet digitized. The order of the Gospels is said to be highly unusual: Mark, Luke, John, Matthew. MS 6 is GA 2613, a manuscript of the Gospels from the 1000’s. The pericope adulterae does not appear in the text of John (though a note in the margin mentions it), but it appears at the very end of the manuscript, following a lectionary-table that occupies several pages after the end of John 21. Matthew: 9. Mark: 183. Luke: 297. John: 485. MS 7 is GA 2614, a manuscript of the Gospels from the 1200’s. Matthew: 21. Mark: 200. Luke: 325. John: 518. 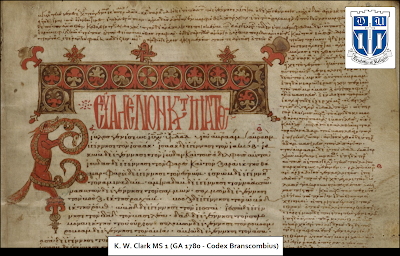 MS 10 is GA Lect 1965, a Gospels-lectionary from the 1100’s. The text is formatted in two columns per page. The Heothinon-series is included. A PDF describing this manuscript, prepared by John Lawrence Sharpe III, is available online. 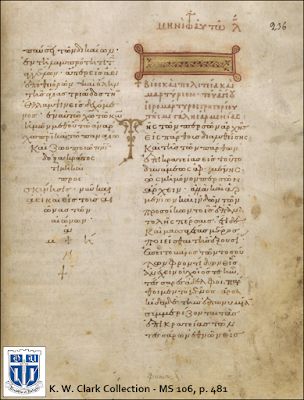 MS 12 is GA Lect 1966, a Gospels-lectionary from c. 1100. The text is formatted in two columns per page. The lection for Saint Pelagia’s Day (October 8), from John 8:3-11, begins on page 365. MS 15 is GA 2615, a manuscript of the Gospels from the 1100’s. Matthew: 5 (missing the opening page). Mark: 145. Luke: 233. John: 382. This manuscript was obtained by Kenneth W. Clark himself in 1950 in Egypt during a trip to Egypt and St. Catherine’s Monastery. In Luke 24:42 its text includes the phrase, “and the rest He gave to them.” A PDF describing this manuscript, prepared by John Lawrence Sharpe III, is available online. The pericope adulterae begins (in the text of John) on 421. Some pages of GA 2615 are missing at the end; the text of John breaks off in 19:12 at the end of a page. Curiously, after the chapter-list for the Gospel of Mark and before the beginning of the text of Mark (perhaps inserted out of order by an ancient repairer of the manuscript), page 138 contains only text from John 20:30b-31. MS 16 is GA 2616, a manuscript of the Gospels from the 1100’s. Matthew: 5. Mark: 167. Luke: 271. John: 443. A PDF describing this manuscript, prepared by John Lawrence Sharpe III, is available online. MS 17 is a Psalter from the 1100’s. with some braided and/or colored initials. It includes most of the Odes at the end, including the Magnificat, extracted from Luke 1:46ff. MS 22 is GA 2491, a fragment from c. 1050. It is not yet digitized. It is a single leaf with text from Matthew 22:31-23:10. MS 24 is GA Lect 1967, from the 1000’s. It is not yet digitized. MS 25 is GA 1813, a manuscript of the Gospels, from c. 1100. Matthew: 19. Mark: 145. Luke: 225. John: 367. A PDF describing this manuscript, prepared by John Lawrence Sharpe III, is available online. The copyist, Hierotheos, mentioned himself in a colophon at the end of the book. MS 28 is GA Lect 648. It is not yet digitized. MS 31 is GA 2766, a manuscript of the Gospels, from the 1200’s. It is not yet digitized. It has pictures of the Evangelists. A PDF describing this manuscript, prepared by John Lawrence Sharpe III, is available online. MS 38 is GA 2757, a manuscript of the Gospels, from c. 1100. Matthew: 25 (Pigment from the picture of Matthew on the opposite page has severely damaged most of the text on this page.) Mark: 165. Luke: 261. (The headpiece to the Gospel of Luke contains the wrong title – Ευαγγέλϊον Κατὰ Μάρκον – as if the artist did not realize where he was at in the book.) John: 421. A PDF describing this manuscript, prepared by John Lawrence Sharpe III, is available online. MS 39 is GA Lect 2138, a very late Gospel-lectionary, from 1627. The text is formatted in two columns per page. A PDF describing this manuscript, prepared by John Lawrence Sharpe III, is available online. The Synaxarion, Heothinon, Menologion are all included. The copyist was Lucas Buzau, a prolific scribe whose manuscripts have reached multiple monasteries and museums. MS 43 is GA Lect 2145, a leaf from a Gospels-lectionary from the 1200’s, containing text from Luke 1:59-80 and Matthew 16:13-18. It is not yet digitized. MS 60 is GA 1423, Codex Daltonianus, a manuscript of the Gospels from c. 1000, with marginal commentary-material. It is not yet digitized. A PDF describing this manuscript, prepared by John Lawrence Sharpe III, is available online. MS 64 is GA 2757, a manuscript of the Gospels from c. 1300. It is not yet digitized. A PDF describing this manuscript, prepared by John Lawrence Sharpe III, is available online. 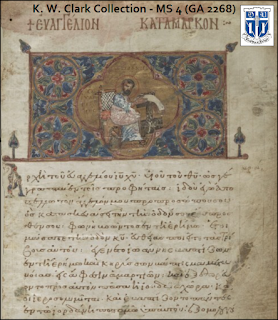 MS 65 is GA Lect 1839, a Gospels-lectionary from the 1000’s. It is not yet digitized. MS 82 is GA Lect 1623, a Gospels-lectionary from c. 1200. It is not yet digitized. MS 83 is GA Lect 302, a Gospels-lectionary from c. 1450. It is not yet digitized. MS 84 is a manuscript of the Gospels from c. 1150. It is not yet digitized. Armenia, begins (for September 30). MS 85 is GA Lect 451, a Gospels-lectionary from 1052. It is not yet digitized. The copyist’s name was Clement. MS 89 is a fragment from a Gospels-lectionary from the 1100’s. It is not yet digitized. It contains text from Matthew 8:31-9:3. MS 92 is a Gospels-lectionary from the 1100’s. It is not yet digitized. MS 93 is a Gospels-lectionary from the 1100’s. It is not yet digitized. MS 100 is a manuscript of the Gospels and Revelation from c. 1000. It is not yet digitized. MS 104 is a late lectionary (c. 1530?) with readings from the Gospels, Acts, and Epistles. It is not yet digitized. Also to be included but not yet digitized is Duke Gr. 53 (ca. AD 1450), Commentary of Theophylact on the Gospel of John with NT text interspersed. Peculiarly, this MS has no GA number even yet, although other Theophylact commentary MSS have a GA number). In this MS, the PA is not included, as is typical for commentaries. So, Lucas Buzau was a prolific scribe. I suppose that could be useful information. What kind of studies have been done of scribal habits where the identity of the scribe is known? May need to take a visit there!